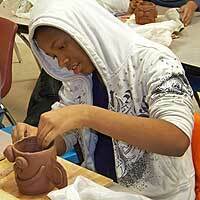 The arts prepare students for success in school. Students who study the arts, especially music, outperform their non-arts peers on mathematical assessments. The arts develop reasoning skills that prepare students to solve problems. Students who study the arts, for example, score higher than their peers on tests measuring the ability to analyze information and solve complex problems, and are more likely to approach problems with patience and persistence. The arts prepare students for success in life. Arts experiences foster pro-social behaviors and social tolerance that help prepare students for life in an increasingly global and culturally diverse world. Ensemble performance, community mural painting, and other group arts experiences in which participants are from diverse backgrounds demonstrate particular value for developing cross-cultural understanding. Students help each other learn a circus skill (rollabolla) in Jef Lambdin’s PE and performance residency. Students at a Fayetteville alternative school building collaboration skills through mime with Sheila Kerrigan.